Tiny beads of silicon, about ten thousand times thinner than a piece of paper, could someday make electric vehicles travel farther on a single charge or extend the life of your laptop's battery, say scientists at the University of Maryland. Rechargeable lithium-ion batteries – the kind in your phone, camera, and some hybrid cars—use graphite as an electrode in the battery. Silicon can store up to ten times more lithium ions than graphite, but until now, silicon structures tended to crack or break when they were used over and over. Now chemists and materials scientists at the University of Maryland have designed a tiny silicon structure for batteries that can last through more charging cycles than previous designs did. 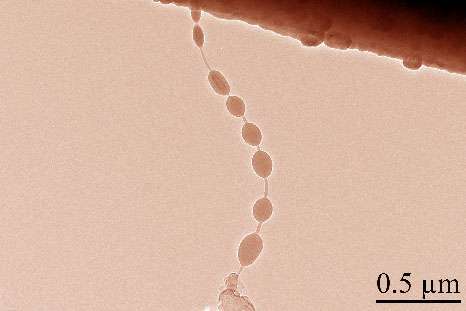 The scientists grew tiny beads of silicon on a carbon nanotube, then used a powerful microscope to watch the electrode charge and discharge. Then they charged the silicon with lithium ions.